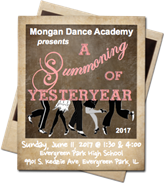 You are summoned to travel through a century of time during our 2017 Recital, "A Summoning of Yesteryear." Beginning with the Roaring 20's, we will witness significant events — the Great Depression, wartime, and prosperity; civil, social, and cultural movements; hippies, disco, rock, pop, and hip hop — right into the 21st century. Sunday, June 11 — RECITAL, "A Summoning of Yesteryear"
Students in Pre-Ballet/Tap 2 and 3 -- Regarding Picture Day Packets, EACH dance style is considered a "class" or "group." For example, if you want a ballet picture (individual and/or group) AND a tap picture (individual and/or group), you must order separate packets. Siblings and friends may have pictures taken together. NOTE: This is considered an additional "group," therefore a separate picture packet is required. All packets MUST be pre-ordered BEFORE Picture Day. Online ordering closes June 2. Please print your online order receipt and give a copy to MDA staff.